A healing antiseptic solution for topical application to wounds such cuts, scratches, abrasions, puncture wounds and minor burns. Calendula officinalis The mother tincture of the Marigold plant is helpful for topical infection, irritation and inflammation of minor injuries. Contains alcohol 40%v/v. Hypericum perforatum The mother tincture of the St John’s Wort plant has antibacterial, anti-inflammatory and pain-relieving properties. Contains alcohol 60%v/v. Colloidal silver A 20% solution is helpful for bacterial and fungal infections. Cleanse the wound with normal saline or clean water and then apply the herbal solution directly to the wound. Repeat 2-3 times daily as required. The solution contains alcohol which may result in a stinging sensation upon initial application. The stinging will ease after a few seconds. 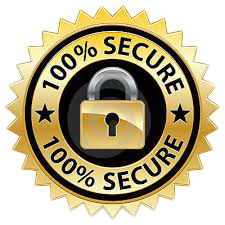 If the wound becomes infected, consider taking the pegasus anti-virabac 200c remedy. If required, one could soak a dressing with the herbal solution and apply to wound. Leave dressing in place undisturbed for 1 – 2 days. Re-soak with the herbal solution from time to time to prevent the dressing from drying out. For minor burns see the Remedy Finder Section for further information. 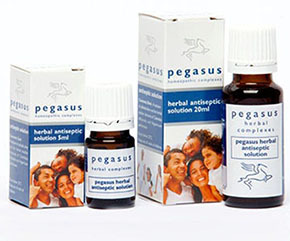 The pegasus herbal antiseptic solution is indicated for topical application to wounds and not for internal ingestion.